Normally, my exercise patterns don’t change with the weather, except for the obvious Summer sluggishness caused by steaming hot weather. Oh, and of course there’s the Winter inclination to huddle indoors, eat comfort food, go into hibernation. Maybe I should admit that, no matter what the time of year, my body likes to be in resting-mode a whole lot better than exercise-mode. But thankfully, my body seems more than willing to kick into gear when I hit the Power button. I guess it never hurts to revisit fitness goals, and the idea of devising particular goals for just the upcoming month of November is intriguing. It wouldn’t hurt (well, actually, it probably would hurt, but only in a ‘good way’) if I really tried to shoot for the moon in November. 30 workouts in 30 days. Total weekly workout time no less than 10 hours. Take 2 back-to-back classes once a week. Try one new class (or new Gym) once a week. Concentrate on healthy eating — mainly plant-based foods, daily vitamin/mineral supplements, no alcohol. Not even an ounce of weight gain. But, that’s just a plan that came into my head extemporaneously — I’m not ready to commit because it’s way too daunting. I have another week or so before November kicks in, and by then I’ll probably be inclined to pick just one or maybe two of these goals. Or, another option is that I’ll just go into early hibernation. no weight gain?? no alcohol?? But Thanksgiving comes in November! Oh, but you did say your list was basic fiction, phew! Well, I know which goals of yours I could go for, but am not saying which ones. Hibernation plan sounds like the best — I love the idea of hunkering down into a nice cozy den and sleeping through the Winter! 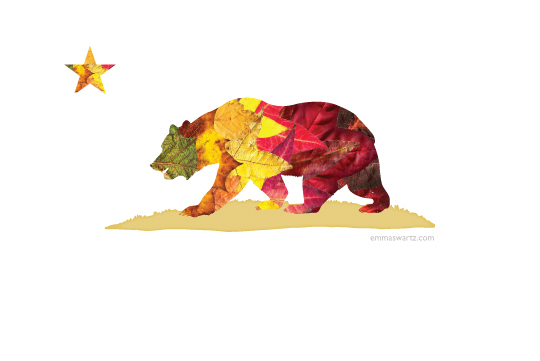 I think I’ll be following that adorable Autumn bear.